Last week I received gorgeous local asparagus in my produce delivery, and it's been sitting in my refrigerator waiting for inspiration to strike. That inspiration came in the form of beets. Yes, beets! I made a vegan beet pesto and decided to serve it on top of simply broiled asparagus. This colorful and nutritious dish is perfect for a Meatless Monday lunch or dinner and is completely vegan! 1. For the beet pesto, place beet quarters, garlic clove, arugula and hazelnuts into a food processor. Pulse. Drizzle in lemon juice and olive oil while running the food processor. Puree until you get the consistency you desire. Season with salt. 2. For asparagus, preheat your broiler. Drizzle asparagus with olive oil and season with salt and pepper. Broil in a single layer for 5-10 minutes, depending on how thick your asparagus is, making sure to check on it often. 3. 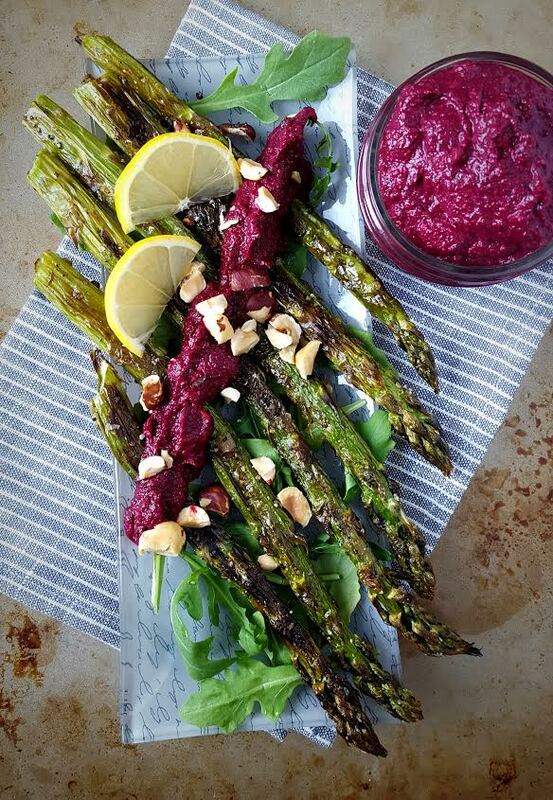 Serve asparagus on a bed of arugula topped with the beet pesto, chopped hazelnuts and a few lemon wedges. I'm glad I took the above photograph with my phone because unfortunately all of my camera photos were awful. This was such a bright (both in color and flavor) dish! I loved how crunchy asparagus got under the broiler: this may be my new favorite way of preparing this spring vegetable. As a bonus, I have a fun idea for you. If you, like me, sometimes don't feel like using beet greens in your cooking but feel guilty tossing them, add them to a flower arrangement! 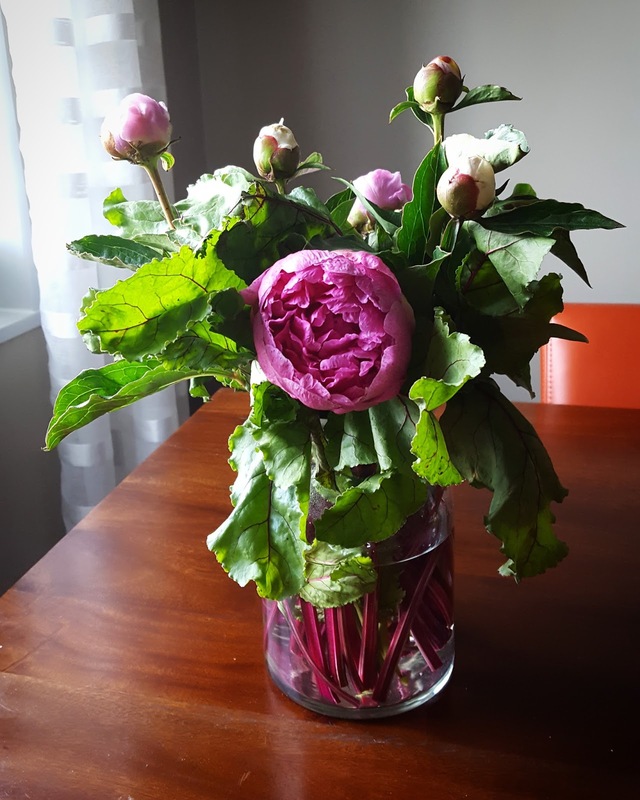 In the photo below, I combined peonies with beet greens!